The One Minute Entrepreneur was the thirteenth book of 2016, which I enjoyed. The One Minute Entrepreneur: The Secret to Creating and Sustaining a Successful Business is a decent book which was a quick read and had numerous similarities to the other similar books I’ve enjoyed the past couple of years. I worked through this when we were in the middle of a long distance move. It is the story of an individual who is operating at an average level and does not understand why he is not able to progress personally in his own life, professionally and personally within his family life. The main character of The One Minute Entrepreneur is an individual is directed to a life counselor and progresses through additional tailored challenges by the life counselor and ultimately improves, often unknowingly and without understanding until after he has successfully progressed and reflecting upon. The One Minute Entrepreneur was an interesting read but it is skippable. If you’d like to try it out you can find it here. What Makes Your Brain Happy was the twelfth book of 2016, which I enjoyed. What Makes Your Brain Happy and Why You Should Do the Opposite is an excellent book to ensure you start overtly thinking about challenging how you think. In my mind, the author provides enough statistics and explanation of how our brains and tendencies operate. His explanations are tied to statistic examples which are compared to the statistically incorrect manner in which our individual experiences may push our decision-making process down the least optimal path. What Makes Your Brain Happy is a good book to get your geek on while thinking about how you personally make decisions and what they are based upon. Recommended! The 2016 China Pentagon Report is below. The 2016 China Pentagon Report is an interesting read. You can read it above via the PDF or simply review the content highlights below. The long-term, comprehensive modernization of the armed forces of the People’s Republic of China (PRC) entered a new phase in 2015 as China unveiled sweeping organizational reforms to overhaul the entire military structure. These reforms aim to strengthen the Chinese Communist Party’s (CCP) control over the military, enhance the PLA’s ability to conduct joint operations, and improve its ability to fight short-duration, high-intensity regional conflicts at greater distances from the Chinese mainland. China’s leaders seek ways to leverage China’s growing military, diplomatic, and economic clout to advance its ambitions to establish regional preeminence and expand its international influence. Chinese leaders have characterized modernization of the People’s Liberation Army (PLA) as essential to achieving great power status and what Chinese President Xi Jinping calls the “China Dream” of national rejuvenation. They portray a strong military as critical to advancing Chinese interests, preventing other countries from taking steps that would damage those interests, and ensuring that China can defend itself and its sovereignty claims. Throughout 2015, China continued to assert sovereignty claims over features in the East and South China Seas. In the East China Sea, China continued to use maritime law enforcement ships and aircraft to patrol near the Senkaku (Diaoyu) Islands in order to challenge Japan’s claim. In the South China Sea, China paused its land reclamation effort in the Spratly Islands in late 2015 after adding more than 3,200 acres of land to the seven features it occupies in the archipelago. Although these artificial islands do not provide China with any additional territorial or maritime rights within the South China Sea, China will be able to use them as persistent civil-military bases to enhance its long-term presence in the South China Sea significantly. China demonstrated a willingness to tolerate higher levels of tension in the pursuit of its interests, especially in pursuit of its territorial claims in the East and South China Sea; however, China still seeks to avoid direct and explicit conflict with the United States. China’s leaders understand that instability or conflict would jeopardize the peaceful external environment that has enabled China’s economic development, which is central to the perpetuation of the CCP’s domestic legitimacy. In the near-term, China is using coercive tactics short of armed conflict, such as the use of law enforcement vessels to enforce maritime claims, to advance their interests in ways that are calculated to fall below the threshold of provoking conflict. In the long term, Chinese leaders are focused on developing the capabilities they deem necessary to deter or defeat adversary power projection and counter third-party—including U.S.—intervention during a crisis or conflict. China’s military modernization is producing capabilities that have the potential to reduce core U.S. military technological advantages. China’s officially-disclosed military budget grew at an average of 9.8 percent per year in inflation-adjusted terms from 2006 through 2015, and Chinese leaders seem committed to sustaining defense spending growth for the foreseeable future, even as China’s economic growth decelerates. The PRC continues to focus on preparing for potential conflict in the Taiwan Strait, but additional missions, such as contingencies in the East and South China Seas and on the Korean peninsula, are increasingly important to the PLA. Moreover, as China’s global footprint and international interests grow, its military modernization program has become more focused on investments and infrastructure to support a range of missions beyond China’s periphery, including power projection, sea lane security, counterpiracy, peacekeeping, and humanitarian assistance/disaster relief (HA/DR). PLA global operations in 2015 included counterpiracy patrols, humanitarian assistance and disaster relief, exercises, and sea lane security operations. China’s November 2015 public confirmation of its intention to build its first overseas military support facility in Djibouti likely reflects this more global outlook, as it will be utilized to sustain the PLA Navy’s operations at greater distances from China. During 2015, the PLA continued to improve key capabilities that would be used in theater contingencies, including cruise missiles; short, medium, and intermediate-range ballistic missiles; high performance aircraft; integrated air defense networks; information operations capabilities; and amphibious and airborne assault units. The PLA is developing and testing new intermediate- and medium-range conventional ballistic missiles as well as longrange, land-attack, and anti-ship cruise missiles, which once operational would extend the military’s reach and push adversary forces further from potential regional conflicts. China is also focusing on counterspace, offensive cyber operations, and electronic warfare (EW) capabilities meant to deny adversaries the advantages of modern, information technology-driven warfare. Despite the PLA’s gains over the last two decades, its modernization program faces challenges. The organizational reforms unveiled by the leadership are part of a broader effort by President Xi to address the PLA’s deficiencies, such as corruption. Since Xi took power in 2012, more than forty senior officers have fallen in a wide-ranging anticorruption campaign that last year ensnared the former top officer in the PLA. Moreover, Xi’s slogan exhorting the PLA to prepare to “fight and win” battles implies that the leadership is concerned about how the PLA, which has not fought a war in more than thirty years, would fare in combat. The Department of Defense (DoD) approach to China is part of a broader U.S. strategy for the Asia-Pacific region that is focused on ensuring and building upon a stable and diversified security order, an open and transparent economic order, and a liberal political order. Combined, these factors have contributed to the peace and prosperity of the entire region since the end of the Second World War, directly benefiting China and its neighbors. U.S. policy toward China is based on the premise that it is in both our countries’ interests to deepen practical cooperation in areas where our countries’ interests overlap, while constructively managing differences. Sustaining positive momentum in the militaryto-military relationship supports U.S. policy objectives to encourage China to uphold international rules and norms and to contribute positively to resolving regional and global problems. DoD seeks to continue building a military-to-military relationship with China that is sustained and substantive. DoD will continue to focus on enhancing risk reduction measures that diminish the potential for incidents or miscalculation, and encourage China to contribute constructively to efforts to maintain peace and stability with the United States, our allies and partners, and the greater international community. While the United States builds a stronger military-to-military relationship with China, DoD will also continue to monitor and adapt to China’s evolving military strategy, doctrine, and force development, and encourage China to be more transparent about its military modernization program. The United States will adapt its forces, posture, investments, and operational concepts to ensure it retains the ability to defend the homeland, deter aggression, protect our allies, and preserve a principled regional order founded in international law and norms that benefit all countries equally. 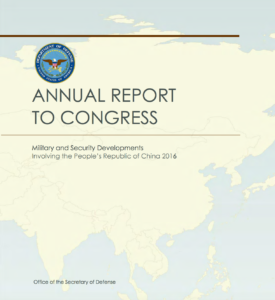 The 2016 China Pentagon Report can be found at Defense.gov under publications.